Twitter is a dead simple way to blog and tell world “What are you doing now?”. This simple tool now has loads of “not so simple” and ever increasing 3 party Twitter based applications. Majority of these application require you to sign in using Twitter account in order to use them. 2. Click Settings and then click Connections tab. 3. You will see list of applications with active access to your Twitter account. 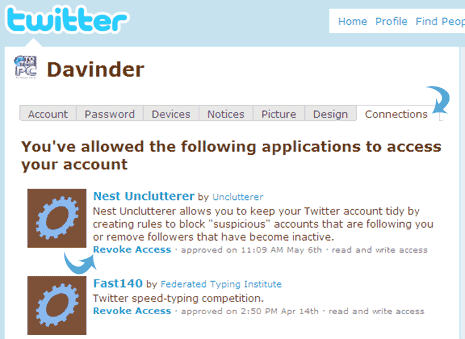 Click on “Revoke Access” to disable specific application from accessing your Twitter account. Head over to your Twitter account and perform some weekend Twitter cleaning. Disable and remove Twitter access for applications which you are not going to use in future, what say?